Described by NPR Music as joyous folk pop, Kuinka “laces modern folk and Americana with an electronic jolt, waltzing along the grooved edges of dream-pop, synth-pop, and Brooklyn’s mid-aughts guitar-rock revival” (Vanyaland). Their genre-defying music features several different lead singers, four-part harmony, and eclectic instrumentation including cello, banjo, synthesizers, ukulele and electronic percussion. For all of their sonic experimentation, the Seattle quartet’s songs and live shows are linked by an infectious energy that remains present in everything they do. 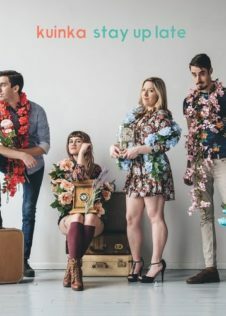 Their new EP Stay Up Late is available now on Spotify, iTunes, and at www.kuinkatheband.com.